Denver, Colorado - St. Clair Software is pleased to release version 5.2.3 of Default Folder X today. This update of its award-winning utility for enhancing Open and Save dialogs adds support for the ForkLift file manager. ForkLift users can now click on open windows behind a file dialog to immediately jump to the folder shown in that window. 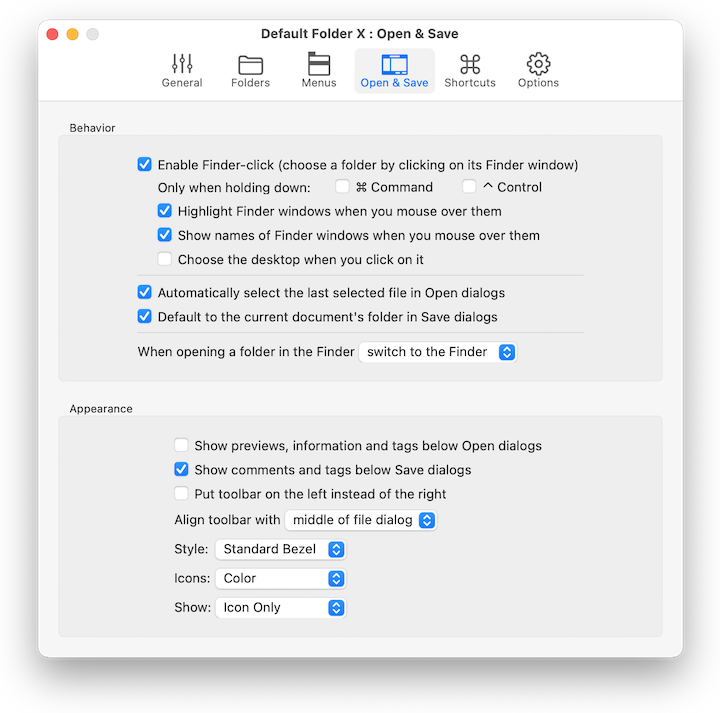 In addition, this release improves the speed of switching between folders in Open and Save dialogs, resolves a compatibility issue with the Magnet window management app, and addresses a number of reliability issues. Default Folder X 5.2.3 is a free update for existing version 5 users. New licenses are $34.95 (USD) and upgrades from version 4 and prior are $14.95. Please see the St. Clair Software web site for screenshots, a full change log, and additional feature information. St. Clair Software strongly recommends that anyone using Default Folder X install this update. Based in Denver, Colorado, St. Clair Software is a privately held company that has been specializing in utilities and custom software solutions for the Macintosh since 1988. St. Clair Software can be contacted at: St. Clair Software, 271 S. Emerson Street, Denver, CO, USA 80209. Copyright (C) 1988-2018 St. Clair Software. All Rights Reserved. Apple, Macintosh, macOS and Finder are registered trademarks of Apple Inc. in the U.S. and/or other countries.